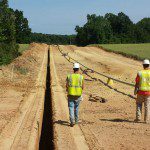 We provide land survey services in North and South Carolina and are committed to efficiency, accuracy, and contributing to the success of your upcoming project. At Professional Property Surveyors, our sister company, we provide land surveying and mapping services in North and South Carolina and are committed to contributing to the success of your upcoming project. We have created surveys for many different clients, including new home buyers, developers, and public utility agencies. Whatever your surveying needs are, we are confident that we will be able to meet them in order to ensure that you are able to make critical deadlines and enable your partners to effectively manage their responsibilities. Whether your upcoming project involves surveying miles of pipeline or identifying an optimum location for a new structure, our survey team is more than prepared to handle the exact specifications of your project. As we complete surveys, we use high quality instruments and abide by proven processes to produce the best results every time. To receive more information about our surveying services or to schedule a land survey, please contact us at Professional Property Surveyors. We value building positive working relationships and are eager to earn your trust and satisfaction when we conduct a land survey for you.